We’re all pretty well acquainted with red glowing coals and the mesmerizing yellowish-amber color from flames in the fireplace, and if you really stare long enough you’ll even notice small glows of blue at the very “bottom” of the flame. But have you ever seen a green flame? 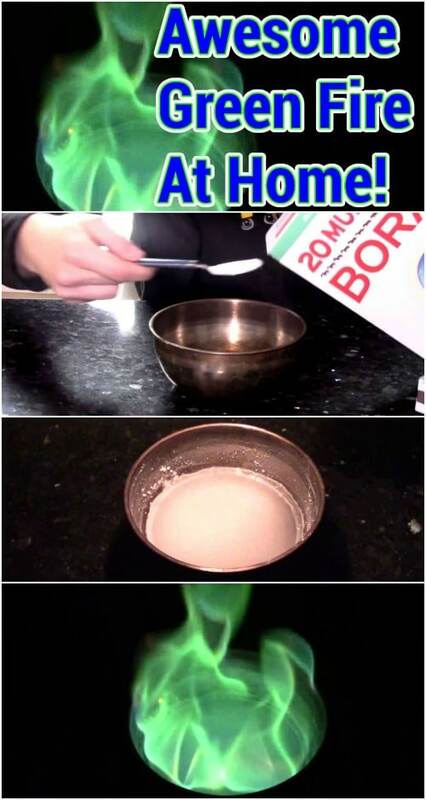 The green flame truly is a fascinating phenomenon. We get so used to the way things are around us, so seeing something in a whole new light—like a green flame when we’re used to yellow—is really exciting. Unless you’re a scientist, of course, then none of this is new to you! When the methanol from the Heet anti-freeze is mixed with the borax from the 20 Mule Team Borax, it creates trimethyl borate. This compound is a colorless liquid that when burned, gives off that distinctive neon green color. There’s no way I can encourage anyone to do this without some very important safety warnings. This should go without saying, but when playing with fire, do so safely outside. This is a situation where caution definitely shouldn’t be thrown to the wind. Furthermore, methanol can be very dangerous, so don’t let it come into contact with your skin, don’t inhale it, and for the love of everything you hold dear, don’t drink it. Throwing a lit match in the mixture won’t give you the full effect, because the match itself will still burn in a yellow-y color. Use a long match so that you can just touch the mixture and then retrieve the match – a regular lighter or normal-sized match will put your hand in too close proximity. Tutorial video by TrollFaceTheMan Youtuber. How long will this burn? Yes, how long will it burn? One more safety note– methanol will also burn as a vapor. DO NOT try to refill your hot bowl. You could end up igniting your entire bottle of methanol. How long will this burn for? This seems like a dangerous adventure from start to finish! This should not be on here due to how some are careless and children as well as pets will die from ingesting antifreeze. Big Thumbs Down!! !